Fleetwood Town boss and former Newcastle midfielder Joey Barton has claimed Sunderland would be promoted by now under him. The 36-year-old has cited the Black Cats' financial advantage - suggesting that only a 'select few' clubs have the resources to challenge for a push to the Championship. And he singled out Sunderland as an example, hinting that he believes he would have done a better job than Jack Ross. In other Cod Army news, midfielder Ryan Taylor is considering retirement - according to boss Barton. In recent weeks, the ex-Newcastle man has been sidelined with a broken nose picked up in a friendly with Wigan Athletic. And Barton admits that he is unlikely to feature in Town's remaining fixtures this term - so is weighing up his future. You can read what Barton told Fleetwood Today HERE. Blackpool boss Terry McPhillips has stressed the importance of tying down players to new deals sooner rather than later. The contracts of Nathan Delfouneso, Donervon Daniels, Jimmy Ryan, Chris Long and Myles Boney all expire at the end of the season. McPhillips has held talks with the club's board over what individuals he would like to keep, but he says there's still more work to be done. HERE's what McPhillips told the Blackpool Gazette. Charlton Athletic manager Lee Bowyer has confirmed the club remain in talks with Arsenal target Joe Aribo over a new contract. “We’re constantly trying to get that over the line. It’s been difficult but Joe loves it here," he said. "He knows that he’s learning, that he’s improving and he knows that this is a good place for him to carry on doing that. Meanwhile, former Newcastle midfielder Lee Clark has revealed he'd be interested in the Addicks managerial role - if Bowyer leaves for QPR. Bradford City midfielder Sean Scannell is set to make his long-awaited return against Doncaster Rovers. Scannell has been out since fracturing his back in October but showed no ill effects on Tuesday, scoring and playing 45 minutes in a training game. “Obviously we’ve got to be careful with him and don’t rush him too stupidly," boss Gary Bowyer told the Telegraph and Argus. In League Two, Peterborough United midfielder Mark O'Hara "100%" wants to join Lincoln City on a permanent basis. 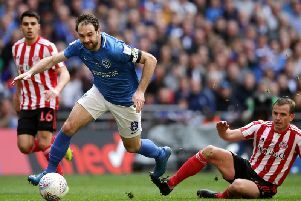 O'Hara is nearing the end of his half-season loan from Posh, where has made 11 appearances for the League Two table toppers. When asked if he wanted to stay at Sincil Bank, he told The Stacey West: “A hundred percent." Notts County owner Alan Hardy has revealed he has accepted an offer to sell the club. A short statement read: “I am pleased to confirm I have accepted an offer to purchase Notts County Football Club from a very credible party, who is now undertaking due diligence. “As expected, there has been a huge level of interest in the club and I am delighted that we are now at an advanced stage with people who I am confident have Notts County’s best interests at heart."